Caturday is Blahturday. | MEOW hear this! After weeks of dodging germs from what seemed like EVERY PERSON IN EXISTENCE, my immune system has finally succumbed. I woke up with a sore throat and it’s just going downhill from there. It was only a matter of time. Everyone at both jobs had some variety of the sickness, including the boyfriend. So instead of enjoying the new cat tree (yes, it’s up! ), I’m whining to Taco in bed. At some point, I will get up and make some of an effort to do something. Not just yet. I also have to drink some apple cider vinegar and I really hate that. But it’s good for the ol’ mucus. Aside from me feeling like someone stuck knives in my throat, I did take some pics of the kitties with their tree last night while I wasn’t aware of the sickness yet. 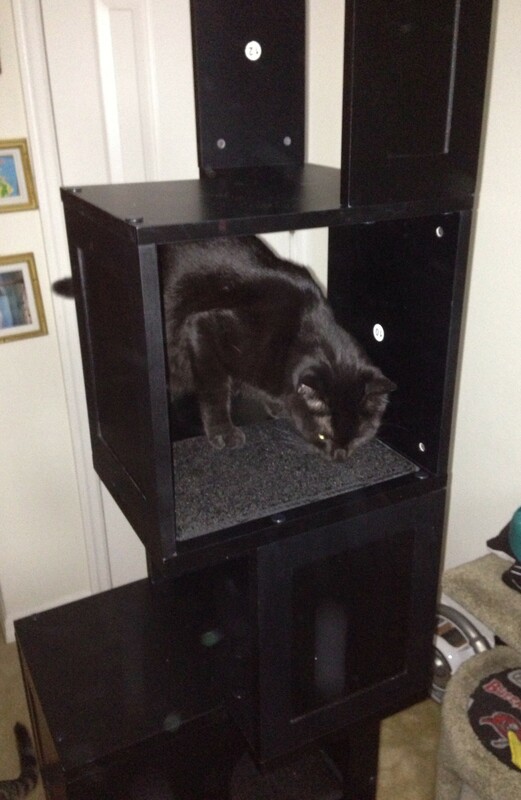 The boyfriend did a lovely job of putting it together without breaking anything. They seem to vaguely enjoy it. Now if we could just agree where to put it. 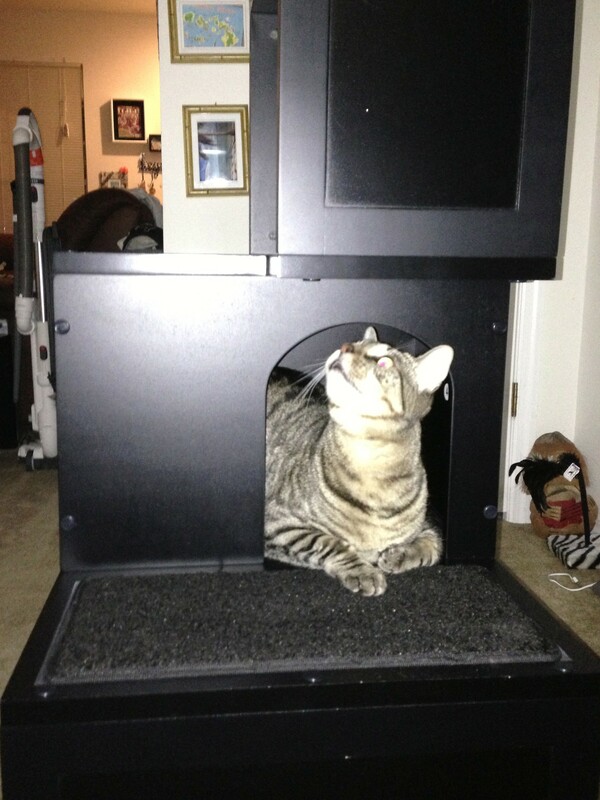 Taco’s chillin’ in his kitty cubby hole! Hard to see Moosh. The tree is black cat camoflauge. Ok, so I took a lot of pictures. I was excited. Wish I still felt that energetic today. DO YOUR JOB, IMMUNE SYSTEM. Oh man, everyone is sick. Feel better. Loving to condo, especially Moosh on the upper deck. Petals would go crazy for that. She’s always jumping on top of everything (much to my dismay). 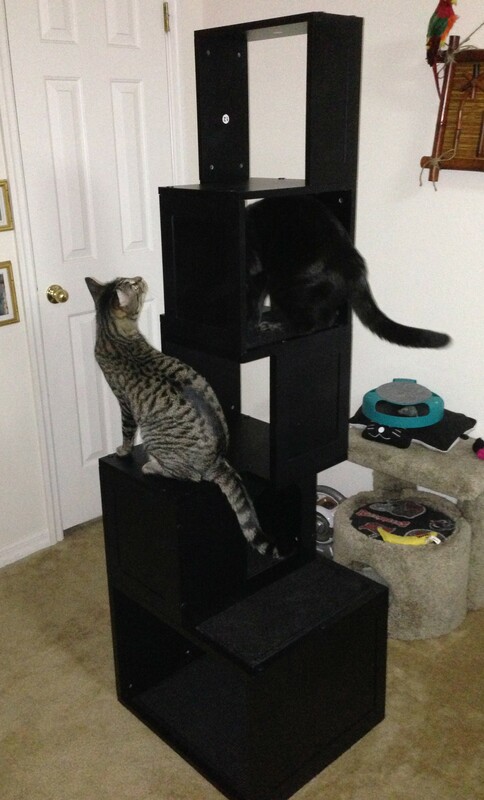 Hahaha that’s EXACTLY why I’ve wanted a cat tree for so long. Moosh wants to be up as high as he can get at all times! I’m working on the sick part…. 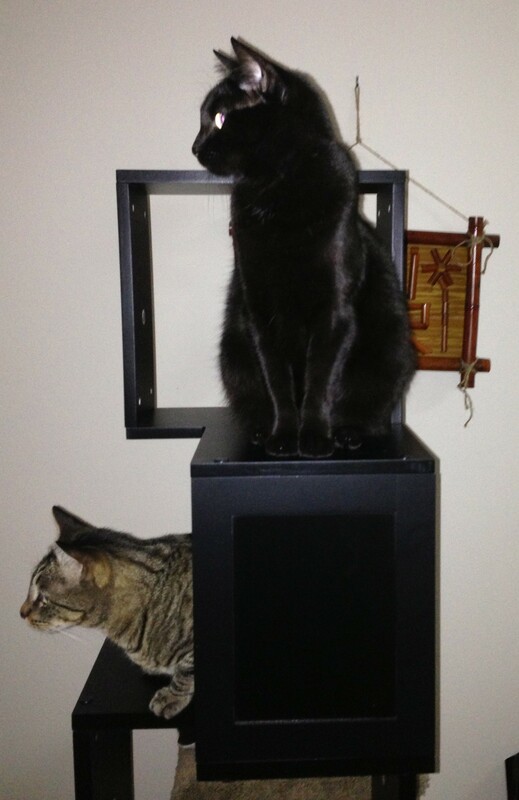 More cat tree fun…and more snot.